I am not sure what I am more proud to show off, my great maxi dress or my great hair day. Well either way, they are both the feature of this post - and when you have petulant and uncompromising curly hair that you must tame every morning, you appreciate the rare moments when it actually behaves. Maybe it was influenced by the dress and felt it needed to be on its best behavior. I certainly was. There are certain outfits in my wardrobe that when worn, make me act a little bit better. I said a little not a lot - a leopard can't ever really change their spots now, can they? 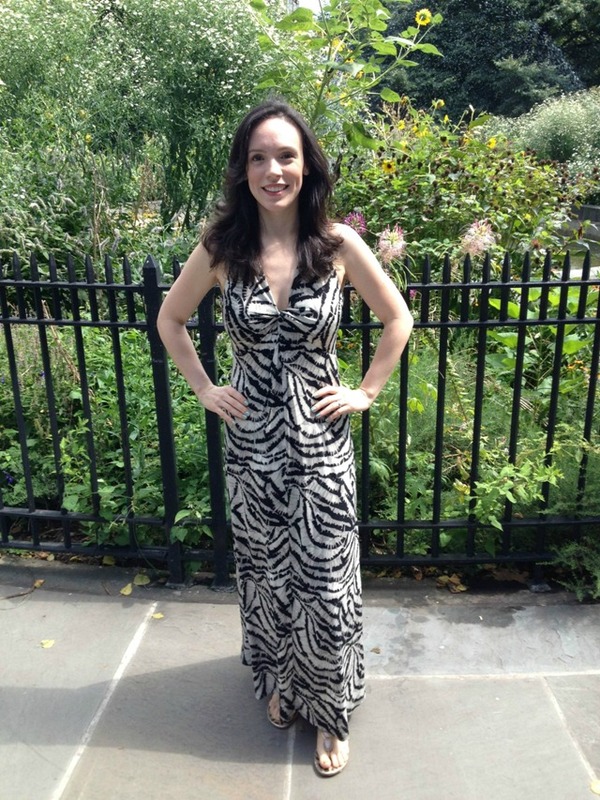 I feel at my utmost summery-est when wearing this Kenneth Cole maxi dress. Though it does have a slightly more formal feel then my other maxi number, I still enjoy wearing it for work or play as it is probably one of the most comfortable dresses I own. Now if you could reach through the computer screen and touch the fabric, you would find it to be a silky Lycra texture with some weight to it. It hangs at just the right length so that it does not dust along the streets as I walk - and in NYC that is a necessity as it may just become radioactive after coming in contact with all the street filth. A sandal is still my shoe choice for the maxi dress - as I do find it odd when paired with heels, unless the dress is too long for you and your heels give you what the good Lord couldn't - a few extra inches. I felt this was a proper farewell outfit to Summer and all the good times we had. Wait - who am I kidding - Summer was sorta bitchy and waged war on my hair with all her humidity antics. But nonetheless - I appreciate the opportunity to parade around in numbers like these. So I guess I can call a truce with Summer - it's never good to hold a fashion grudge.